The young Duke and Duchess of Cambridge are making their first official visit to California on July 8-10, during what California's Travel & Tourism Commission (CTTC) is gleefully calling "The Royal Summer." While the newlyweds will touch down on California soil for a mere three days, the market-savvy execs at CTTC know a good thing when they see it. “We are thrilled to welcome the royal newlyweds to California this summer,” said Caroline Beteta, the CTTC's President and CEO. She considers the visit a "once-in-a-generation occasion." The Royal Summer is a statewide celebration and collaboration among California’s travel industry partners and destinations around the state. Be it following in Will and Kate’s footsteps, embracing their active lifestyle or booking a holiday fit for a king, travelers can enjoy California’s diversity and abundance with a distinctly regal twist throughout July and August. Hotels, attractions and venues statewide will be offering special Royal Summer packages and playfully-themed experiences, giving everyone the opportunity to bask in the royal afterglow. From over-the-top luxury and British-inspired to value-driven and quirky, the People’s Prince and Princess, as the down-to-earth couple are often referred to, would surely approve of the inclusive nature of California’s Royal Summer. No details yet about packages, because the news of the visit was just released over the weekend. But you can bet that hotels, restaurants and even amusement parks are scrambling like mad to come up with Royal Visit Specials. For updates about the "Royal Summer," go to VisitCalifornia.com. While there you can also download a free copy of the California Visitor's Guide. 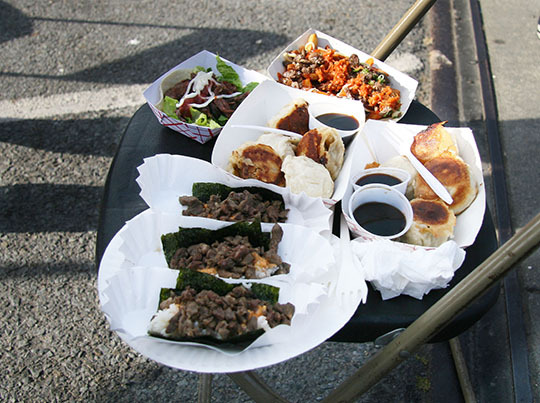 San Francisco's new Friday-night "must"
"Off the Grid" is a fun, fabulous and inexpensive new food adventure that will spice up your Friday nights in San Francisco. It ramped up in mid-April, and I blew by there with a couple of friends last Friday night to check it out. We loved it! Here's the scoop. At least two dozen food trucks and tented vendors form a circle in the parking lot of Fort Mason Center. Chairs and tables are set up inside the circle, along with a sound system for the free live music. The trucks open for biz at 5 (Friday nights only), but the lines start forming early. That's because the food is deliciously ethnic, doesn't cost a fortune, and offers some unexpected suprises (e.g., the Creme Brulee Cart). It's hard to make decisions when confronted with such bounty, so--just like everyone else--we walked around and seriously studied the menus, deciding what to spend our dollars on. BTW, there's also a tented bar on site, so you can wash down that hot curry or those sizzlin' kabobs with a nice chill brew. Some people stay here for a couple of hours, turning the experience into an evening out--maybe strolling along the water after leaving Fort Mason. Others, like us, eat and head elsewhere. 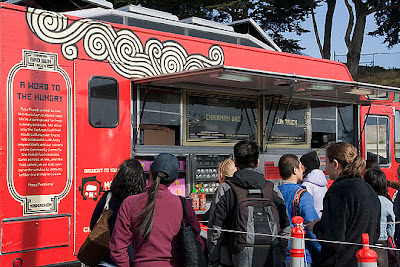 That's easy to do since you're close to lively areas like Chestnut Street, Ghirardelli Square, and Fisherman's Wharf. Public transportation is nearby, as well. As for us, we headed over to Pier 43-1/2 and embarked on a new Red & White Fleet cruise to Treasure Island for a spot of wine tasting. But that's another story. When: Friday nights, 5-9 p.m.
More Info: Off the Grid website. Last night the annual James Beard Awards—known as “the Oscars of the food world”—were handed out in New York City’s Avery Fisher Hall. This prestigious award carries no monetary prize, but it's hard to think of a greater honor in the culinary/beverage world. This year I took particular interest in winners and nominees from my part of the planet--San Francisco, Napa Valley, and Sonoma. I'll list those, with their designations, below. Except for Michael Tusk, winner in the category of Best Chef in the Pacific Region, those below were all among the 5 nominees in their category. But being nominated for a James Beard Award is akin to being an Oscar nominee--it's a huge honor just to be nominated. To learn more about the awards and the other category winners, visit the James Beard Foundation website. or download a PDF of the winners. Best Chef, Pacific: The winner in this category was Michael Tusk of Quince in San Francisco; local nominees were Christopher Kostow of The Restaurant at Meadowood in St. Helena, Daniel Patterson of COI in San Francisco, and Richard Reddington of Redd in Yountville. 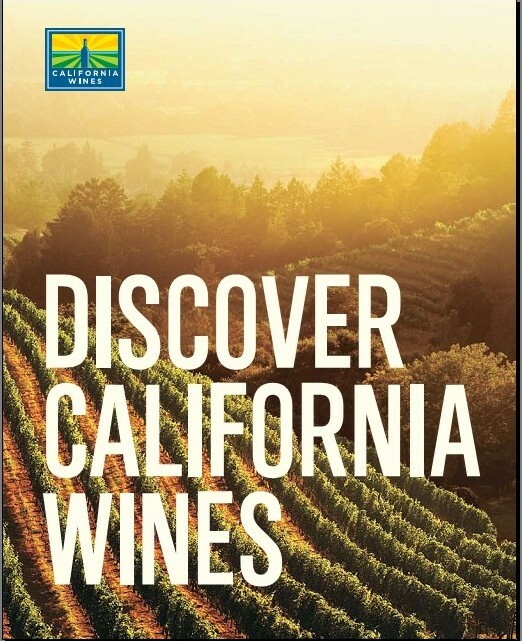 California's Wine Institute, an advocacy group representing more than 1,000 of the state's wineries, has produced two giveaways, a video and a brochure, both entitled "Discover California Wines." They're both beautifully done (the video will make you want to hop into your car right away and go touring wine regions). 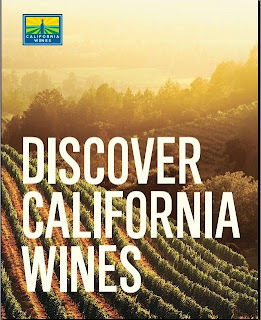 The 54-page Discover California Wines brochure covers all the state's major wine regions and highlights several varietals. It also discusses sustainability, regional cuisine, wine/food pairing, and includes statistics, a map, and a list of appellations. The photographs are simply gorgeous. You can download a free copy. The 3-minute video, below, covers some of the same territory, but brings it vibrantly to life.